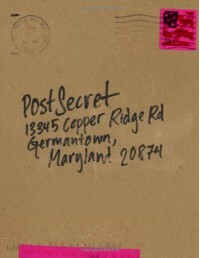 This was my very first Post Secret book that I not only read, but own as well. There were some very interesting bits in the book and some very shocking ones too. I swear I felt normal after having read a few of the entries and also had a few of my friends read some of the book. It helped a few to feel better, to laugh, even realize that the situation they were in wasn't as big of a deal afterwards.